Can we capture methane from the Arctic seabed? Stephen H. Salter, School of Engineering, University of Edinburgh, Scotland. Prepared for the John Nissen Methane Workshop, Chiswick 15,16 October 2011. DRAFT 3 November with pressure ridge addition. Methane is a greenhouse gas more than 100 times more effective than carbon dioxide in the short term. It is stored in the form of clathrates which are unstable if pressure is lower or temperature is higher than a line on a pressure versus temperature graph. Figure 1 shows that the slope of the atmospheric concentration has sharply increased since 2007. Previous high levels of methane were associated with the Permian mass extinction, 250 million years ago. Figure 1. Anomalies of CH4 mean volume mixing ratios for Northern and Southern hemispheres courtesy Leonid Yurganov. Updated mixing ratios (Dlugokencky et al., 2009) were subtracted from the seasonal cycles averaged over 2003-2007. The right scale shows the anomaly of total mass of CH4 in the tropospheric layer of each hemisphere. 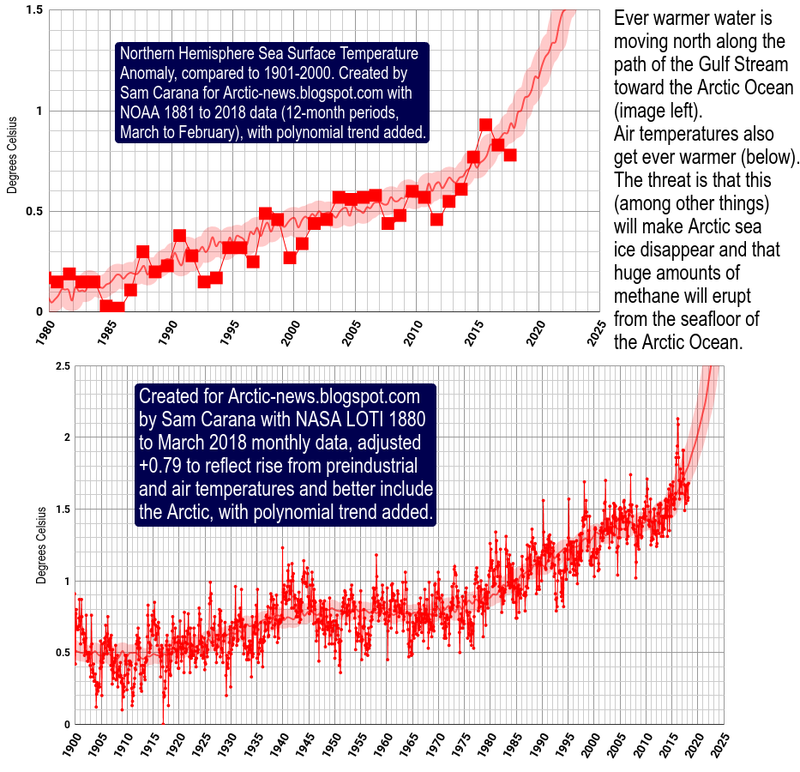 The growth has been continuing in 2010-2011, according to the updated satellite data by Frankenberg et al. 2011. This note discusses the design problems of a system to deploy kilometre-sized areas of plastic film to collect methane from suitable areas of the sea bed. The gas can be flared off at sea to convert it to less damaging carbon dioxide or perhaps, if there are very high flow rates, recovered by a gas carrier and used ashore. There seem to be solutions to what appeared initially to be an insoluble problem. Methane release at very low flow rates over too wide an area. Release at very high rates over a small area such as a well blow-out. The presence of obstructions such as wreckage, rock outcrops, munitions or steep slopes. Fast, variable-direction or unpredictable currents. Equipment sinking into very soft ooze on the seabed. Unacceptable biological consequences due to the presence of equipment. The need to recover everything at some date in the future. The pressure ridges shown by Peter Wadhams at the Chiswick workshop. I now believe that despite these problems methane can be captured in quite large quantities from areas of several square kilometres of plastic film in a single installation. The film sheet is packed into a pair of left and right-handed rubber trough cases  and  with a rectangular inner section as shown in figure 2. Each trough case carries two steel cables . The trough cases would be produced by a continuous moulding/extrusion machine in lengths of several kilometres using plant similar to that used for electrical cables. The left and right handed pair are connected at the centre by two thin isthmus strips of material   above and below a rectangular section passage. The passage contains a rectangular section runner  with two blades   which can be pulled through the full length of the extrusion by a steel cable. . If the steel cable is pulled the two blades will cut the connection strips and the trough case halves will be separated. 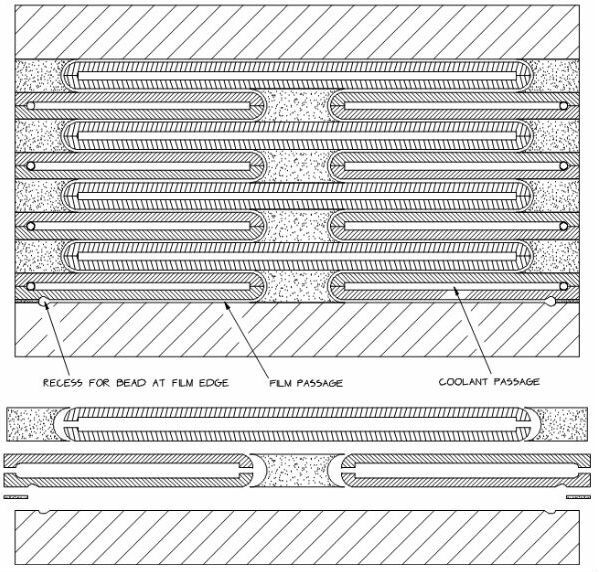 The underside of the trough case extrusion has a moulded tread with a pattern of saw-tooth section ridges  lying at an angle of about 30 degrees to the length of the extrusion. This ridge angle is an important design parameter. At the outer corners of the bottom of the insides of the trough cases are recesses  into which a bead on the edge of an extruded plastic sheet can be pushed. The outer walls of the trough are much thicker than the inner walls and contain galleries  along which methane can be transported to riser pipes. They connect to the higher points of the saw-tooth moulding. A high-density filler is added to the rubber to make sure that it is heavier than cold sea water but not heavier than the ooze on the sea bed. The outer edges of the extrusion  are sloped like the front of a sledge. At the bottom of figure 2 the troughs are shown filled with a zig-zag stack of flexible plastic with a density just greater than cold sea water and a thickness of about 200 microns. The zig-zag stacks on each side a joined at the top . The lower edges with a bead are pushed into the recesses in each trough. This plastic would be produced by a second extrusion machine consisting of interdigital plates to be described later. If the width of each trough is one metre and the trough depth is 150 mm there will be space for 750 layers of zig-zag plastic, giving an extended width of 1.5 kilometres when the zig-zags on the two sides are unpacked. The stacks of plastic film can be packed securely by lid flaps  retained by a vacuum maintained through pipes . The length of plastic and rubber would be wound in a single scroll on the drum of a pipe-laying vessel such as the Stena Apache. A drum diameter of 35 meters could take a width of 1.5 kilometres and length of 3 kilometres, giving a capture area of 4.5 square kilometres. Figure 2. Empty and filled extruded rubber trough cases with 4 times enlarged views of end and centre. Survey vessels with side-scan sonar and methane detection sensors would look for suitable sites with no large obstructions, suitable current velocities and comfortable methane emission rates. Small obstructions can be levelled with robotic sea bed vehicles such as the one described at the 2011 EWTEC conference. The pipe-laying vessel would take station well downstream of the target area and pay out the scrolled material to the sea bed as if it were oil pipe. The extreme flexibility of the trough case (relative to 12 inch steel pipe) would allow wave tolerant J-lay rather than an S-lay release. Once the full length of the package is on the sea bed (figure 3) it would be towed along the seabed by ropes attached to the fore end of the rubber extrusions until it reached a point before the start of the target area equal to the string length divided by the cosine of the ridge angle. If possible the tow direction should be perpendicular to current and swell. The central cable with knife blades would be pulled through the rubber extrusion to separate the two troughs. The vacuum retaining the lid flaps will be released. Towing to increase the width of the film can now begin. Towing from the pipe-laying vessel would mean lifting the leading edge of the pack and there might be disturbance by waves. It is preferable to use a horizontal force from a sea bed walking vehicle. There might sometimes be an advantage in raising and lowering the leading edge in the way used for aligning carpets. The tow force would depend on the weight of the package in water and the coefficient of friction to the sea bed. This is expected to be about 250 kN. This will set the size of the steel cables embedded in the rubber extrusions which transmit the tow force along the length of the rubber and the bollard pull of the tow vehicles. The tow vehicles will keep the tow lines pointing along the line of the package but the angled ridges would make the two troughs move apart from each other and so the tow vehicles will take diverging courses. The layers of plastic film will be pulled away from the zig-zag stack, as shown in figure 3, with the weight of the retaining lids providing a gentle resisting force.. GPS systems will be used to keep the advance rate of the tow vehicles matched. The small density difference between plastic and sea water will mean that the drag friction between plastic and sea bed will be very low with a factor of safety of several hundred relative to the plastic strength. The ridges in the rubber extrusion will leave furrows on the surface of the seabed. When the furrows are covered by the plastic sheet they will form passages for the removal of gas through galleries in the outer walls of the trough. The outward movement of the trough cases will build up material from the sea bed at the front of the outer sledge faces. Water moving through eductor jets  can move some of the sea bed material over the film. The gas pipe connection from below the film to the surface will bring its pressure closer to atmospheric. Eventually several bars of water pressure will clamp the film and trough casings firmly to the sea bed. of the trough cases. Proportions are grossly distorted. Thermo-plastic films can be made by heating pellets of the feed stock to their melting point, pumping the liquid material through fine gaps in an extrusion tool and progressively cooling the downstream section of the tool to a temperature at which the film can be handled. The energy requirement is the sum of melting heat and pumping pressure. Much of the heat can be recycled back to the incoming feed stock. The product is easier to handle if the pumping is in a downward direction. The tool will consist of one inner and two outer stacks of plates each of which consists of two half plates which have been machined with a zig-zag coolant channel and then riveted and spot-welded back together as shown in figure 4. The key problem is maintaining an accurate gap, probably 200 microns, between inner and outer plates. Gravitational sag will be avoided if plates are vertical. At the top of the tool where the film material is still liquid the gap can be defined by streamlined shims but in the cooler regions it must be actively controlled with no physical blockage. Material from a rolling mill usually has quite large flatness errors and a skin under compression. The first step will be stress relief by raising the plate temperature to 650 C for an hour and cooling it slowly. Toolroom surface grinders can work to a flatness better than 3 microns but if curved parts are held flat on a magnetic chuck the curvature will be restored when the magnetic flux is removed. It will be necessary to hold the plates on a hot wax chuck as used in the optical industry. It might be useful to consider a low-force cutting technique such as spark erosion. Figure 4. A grossly distorted plan view of the topology of the extrusion tool with exploded parts. A 1500 metre width would require 750 plates rather than eight. Maintaining a gap for the film thickness is a challenging problem but may be done with differential temperature control. The tool for a 1500 metre width of film would weigh about 200 tonnes. If the differential temperature idea is not feasible, smaller tools could be used but a way to store and join kilometre lengths edge to edge would be needed. Temporary coiling looks difficult. We can use an array of capacitance transducers to measure the gap between plates of an assembled stack. We can cover the surfaces of plates with resistive heating elements either side of the cooling channels. By differential control of the heating currents we can control the local curvature of a plate. The coefficient of thermal expansion of stainless steel is 17 part per million per C degree. A temperature difference of 1C across a 15 mm plate will induce a radius of curvature of 440 metres. If the width of the heating element is 100 mm this means a deflection of 11 microns. A neat way to provide plate deflection control is to divide the plate surfaces into 100 mm squares with a resistive layer filling most of the area. The squares would be connected in series and driven with a constant current from a high impedance source rather than a constant voltage. The current would be diverted around the heating element by a parallel, high-frequency switch operated for a variable fraction of the time. A small fraction of the surface with a grounded guard backing would be given a high-frequency excitation to measure the capacitance to the adjacent plate. Cold heat exchanger fluid will be pumped into the bottom of the vertical tooling plates and emerge from the top at nearly the melting temperature of the plastic film. After some extra heating the fluid will then move downwards through a vertical-tube heat-exchanger to melt the incoming plastic. Solidified film coming out of the bottom of the tool will be further cooled by an upward flow air which will then be directed down through a bed of rising feed pellets and shredded plastic being recycled. Air can flow easily through gaps between pellets or shredded feed stock. The surface area of pellets is large even if heat transfer per unit area is low. Heat can flow more easily between liquids. However there will be an awkward gap between solid but nearly molten pellets in the air in the pellet heat exchanger and liquid in the one above it. Although the temperature difference might be quite small the amount of latent heat of fusion might be substantial. A slide (number 34) from the Shakova - Semiletov paper given at the November 30 2010 DoD workshop in Washington, gives a figure for methane flux of 44 grams per square metre a day over half a 500 metre transect, shown below. This is well above other observations. The calorific value of methane is 55 MJ per kilogram so this would be a thermal power of 28 MW per square kilometre. These conditions might well not apply to the full film area and, at this rate, it would probably not be worth collecting methane on a ship. In future the rate, and gas prices, might increase. However the power level should be enough to drive a mechanism with chain saws and heat transfer pipes to keep a clear hole for a flaring stack in a moving winter ice field if methane release in winter was thought to be a problem. This paper has described what I believe to be the largest possible collector area using present technology. We need to know more about the size and spacing of release plumes to decide if the area has to be as large as this. One example of the kind of data needed is given in figure 5.
and also zooplankton other non-bubble scatterers such as fish. The Shakhova presentation also mentioned total areas of methane hot spots of 210,000 square kilometres, the area of a square of side 460 kilometres. The proposed design needs about 200 tonnes of plastic film per square kilometre. Total world consumption of plastics in 2010 was about 300 million tonnes and forecast to rise to 538 million in 2020. Protecting the Shakova area with coverings which lasted 10 years would take about 1.5% of total present world plastic production. Maintenance would be very difficult and is not planned. But anyone putting anything into the sea has an ethical duty to plan for its recovery. The proposal is to make structures of two cutting discs about 2 metres in diameter separated at 12 metres which can roll along the length of the film to cut it into 12 metre wide strips. The ends of the cut can be gripped with a vacuum plate, lifted to the surface and wound round a drum. The area of the long side of a 3 km length sheet of clean film is only 0.6 square metres. Over a period of years it will probably have acquired biological growths, some of which can be removed by pulling it between contra-rotating brushes. It is desirable that growth thickness can be reduced to the level at which film can be packed into 2.2 metre diameter for movement in a sea container. For a film length of 3 kilometres this means a thickness of film plus growth of 1.25 mm. 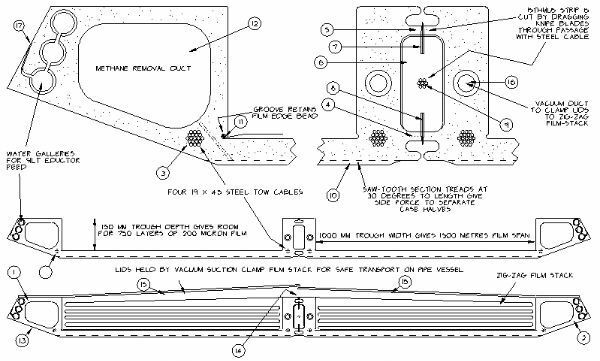 The extruded rubber trough cases would be wound on the drum of a pipe-laying vessel. Comments on the feasibility of this proposal, however critical, would be welcome. 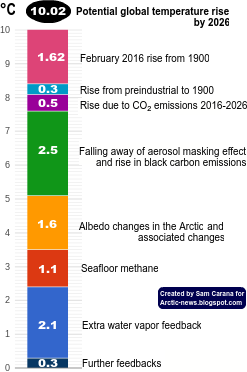 There is a wide range of estimates for the rates of methane release from Arctic seabeds but the higher ones are alarming enough for all defensive measures to be carefully examined. Initial design work for the manufacture and deployment of kilometre-sized areas of plastic film to capture methane suggests that that this may be possible for a range of emission rates provided that the areas of the sea bed are clear of obstructions. This conclusion should be checked with people from the plastic and rubber industries. Deployment and recovery will require pipe-laying vessels from the oil industry , such as the Stena Apache, and specialised seabed crawlers which have been designed for wave and tidal-stream installation. Unless methane emission rates are even higher than suggested it will not be economical to recover methane for use on land and so flaring off at sea is more likely. However there may be enough energy to drive ice-cutting equipment to keep the water round a flare stack clear of drifting ice in winter. The extrusion tool for a 1500 metre width will require about 200 tonnes of very flat stainless steel sheet. The critical problem is maintaining an accurate gap in the extrusion tool. This can be done with differential temperature control of opposite surfaces of a stack of interdigital plates with central cooling channels. The separation of halves of a film package can be done by the force generated from angled saw-tooth ridges on the underside when the package is dragged over the sea bed. This allows very wide film coverage from an easily transported package and leaves tracks for methane flow. If the underside of the film has a pipe connection to the atmosphere the pressure from water above it will clamp it firmly to the sea bed. Work on long-term biological testing of candidate film materials should begin as soon as possible. It is necessary to have credible techniques to recover all materials from the sea bed. The proposed method must be critically checked by experienced offshore engineers. A 4.5 square kilometre area of 200 micron sheet will need about 930 tonnes or 25 railway trucks of plastic but this is small compared with world production. Energy consumption in the present plastics industry is about 10 MJ a kilogram compared with 2.25 MJ for the latent heat of steam. If the film extrusion velocity is 10 mm a second we will need 3.5 days for one pack and a power of 35 MW. Heat pump technology could give a very large reduction in energy consumption and must be carefully investigated. We may have to avoid deployment in water depths less than the deepest pressure ridges. The leading ice authority, Peter Wadhams, says that these can reach down to 34 metres below the surface. Resolve the three-order of magnitude dispute about methane release rates and investigate sea bed methane release rates and their variability in space and time. Check design assumptions with the plastic film and rubber extrusion industry. Choose the best candidate film materials with density just greater than cold sea water (1028.4 kg/m3) and establish stress capability in working conditions. A large strain length is more important than tensile strength. Place specimens of the various film types in suitable test site in northern Norway and observe biological results especially recolonization rates. The earlier this begins the better. Albert Kallio has warned about anoxic conditions below the film. The area of test film must be large enough to replicate this. Measure tow forces on 5-metre sized blocks and establish the best ridge angle for a range of sea bed conditions from gravel to sand to ooze. Place blocks of various shapes and densities fitted with accelerometers on the sea bed and measure how many roll or slide. Carry out a sonar side-scan survey to identify obstructions in suitable areas. Some, such as bullion cargoes, may be removable. Collect information on depth and occurrence of pressure ridges in methane release areas. Pray that the continual underestimation of the potential climate risks by people who are responsible for defending us against them does not continue. Dlugokencky, E. J., L. M. P. Bruhwiler, J. W. C. White, L. K. Emmons, P. C. Novelli, S. A. Montzka, K. A. Masarie, P. M. Lang, A. M. Crotwell, J. 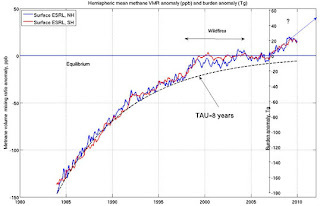 B. Miller and L. V. Gatti (2009), Observational constraints on recent increases in the atmospheric CH4 burden, Geophysical Research Letters, 36, L18803, 10.1029/2009GL039780. 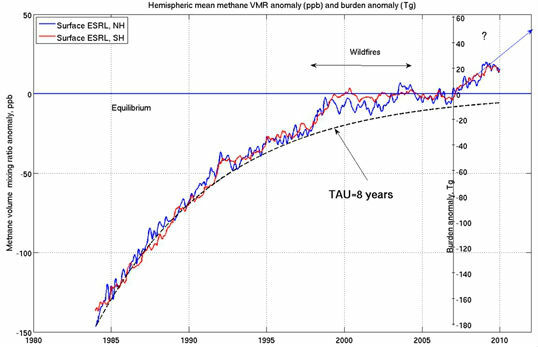 Frankenberg, C., I. Aben, P. Bergamaschi, E. J. Dlugokencky, R. van Hees, S. Houweling, P. van der Meer, R. Snel P. Dol (2011), Global column-averaged methane mixing ratios from 2003 to 2009 as derived from SCIAMACHY: Trends and variability, Journal of Geophysical Research-Atmospheres, 116(D04302), 1-12, 10.1029/2010JD014849. Montzka, S. A., E. J. Dlugokencky and J. H. Butler (2011), Non-CO2 greenhouse gases and climate change, NATURE, 476, 43-50, 10.1038/nature10322. Is any government on the planet taking this up? Since methane is lighter than air, our only hope seems to be trapping it literally as it's released. So, what's the plan?